More Of Him: Show and Tell Friday! 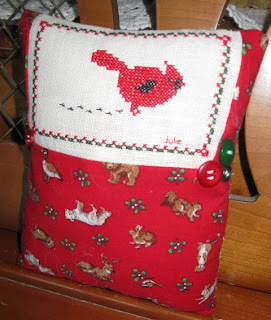 It's Show & Tell Friday and today I am going to share a cross stitch piece I made in time for Christmas. The design is from Daffy Cat, who generously shared her own design with me! 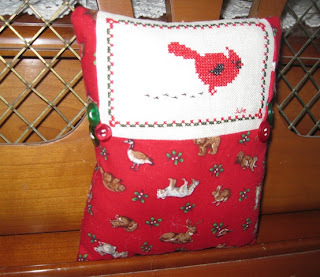 I only had a small piece of fabric, so I only used the bird and border part of the design. It turned out perfect and I absolutely love this design. 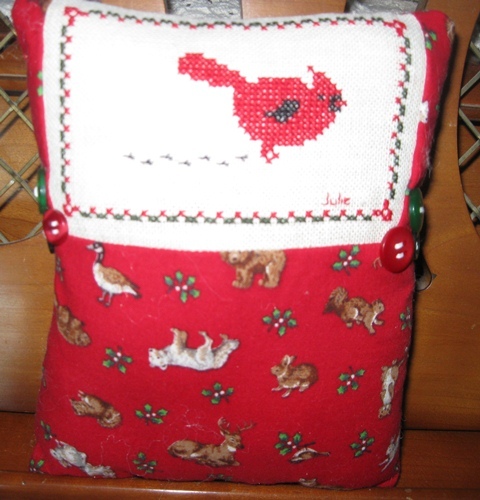 Thank you, Daffy Cat, for your beautiful cross stitch design! The pattern was actually for an ornament, but I decided to make a small, decorative pillow out of it. I added buttons and I'm thinking I might add a green ribbon around the red patterned fabric when I can get back out to my studio. In any case, I love it and I am planning on making one with the entire pattern. You can see Daffy Cat's pattern HERE. You'll need to email Daffy Cat and she will send you the pattern. Don't you just love it? Be sure and share your own Show & Tell at the bottom of this post on the linky. I would love to see what you're up to in your crafting, decorating, cooking or whatever! Hi, Julie! The cross stitch pattern is simply darling! I don't do needlework of any kind; I wish I did. Your pillow is beautiful!